Lately I've been ogling gorgeous photos of nifty offices in magazines like Elle Decor and House Beautiful. Someday I'd love to have a glam and functional workspace, tailored just for moi. The little workspace at my current residence leaves much to be desired. But then again, what can you expect in an 815 square ft. apartment, right? : ) Besides, I do the majority of my blogging, reading and internet scouring from the comfort of my couch anyway, so I'm not sure it would get much use even if I did have a home office. Lately though, I've been thinking of redecorating my workspace at my real job, (yep, I really do have one of those), making it more fun and less, well, office-y. 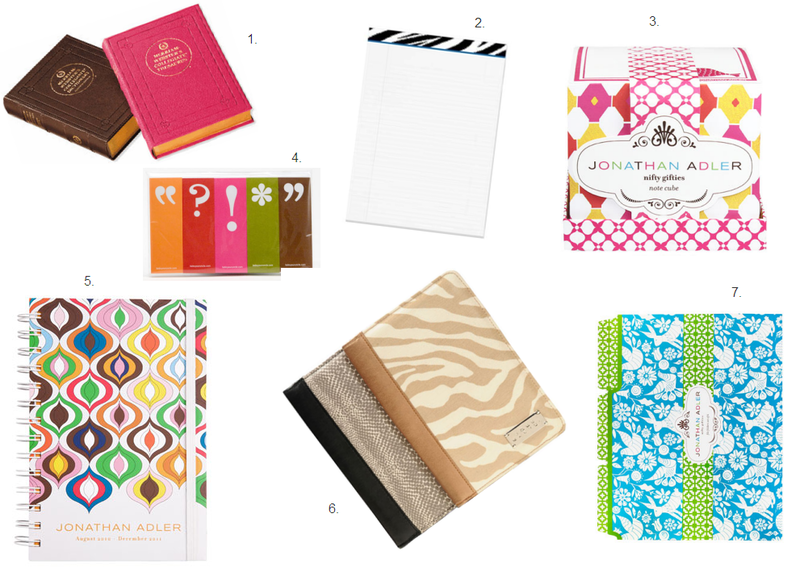 With loads of color and prints that pop, I'm sure to get bookoos of work done, right? Pretending to strangle him in front of the tree last year : ) Quality of the pic is horrible, but at least you can get a sense of the sibling love, ha! I just did a little redo to my office office. Every few months I decide I need a new color to look at all day! haha! I just used Vera Bradley's Bali Gold desk accessories! I LOVE the lion and tamer vases! You could put scissors, letter openers, etc. in them. Cute stuff, lady! something about cute office supplies always makes work more fun...at least the first five minutes of it, anyway :) i have an addiction to fun stationery, pens, and other pretty desk things, but hey, anything that makes me more productive, right?! My home office and my office office are in dire need of redecorating. I love all of these fabulous finds. I feel the same way about the office space in my apartment. We are in 800 square feet - and that includes the porch! I've been itching to do a makeover to make things more fun and girly. If I am succesful, perhaps I'll pass it along to guest post? I don't have an office I have a cube. And basically atrocious! Drab, industrial. I'm sure there is something I could do to make it more homey but I haven't. that office from Lonny is one of my DREAMS. for sure..i want my home office ot one day mirror that..i dont care if i copy it lol. I'm not sure if it will make you more productive, but I'm liking the stuff you picked out. Our home office is the saddest looking room in the whole apartment :( It needs a makeover desperately. I'm loving that chair! 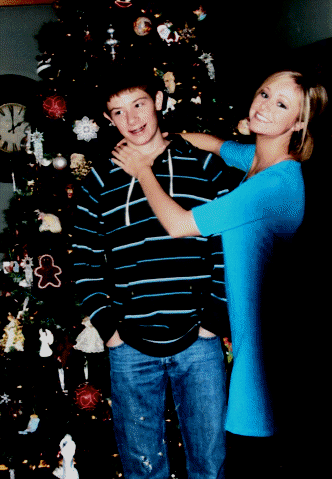 And happy birthday to your little brother!! I have the most boring office EVAH! But I work with all men, so I'm lucky that we even have a clear path to walk. i just love love love jonathan adler. i do not love love love his prices!! Hey doll!! I developed the idea for "Featured Followers by Elle© " This is how I promote all my followers, help them increase traffic to their blog & allow my followers to learn more about the blogs that I feature. There are 5 different programs. Check out my blog at www.edkdolce.blogspot.com to find out more! Oh I love all of that stuff! 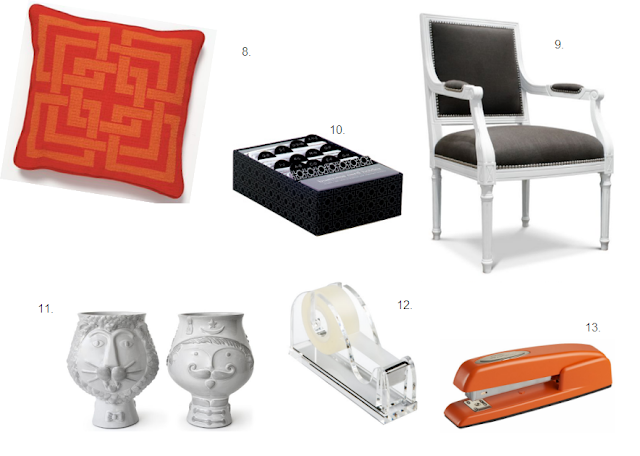 Especially the Jonathan Adler stuff! Love your posts! My apnt has no room for anything and I love cute organizational stuff from j adler, west elm, brocade home, etc. It's so hard to keep things neat, but still cute! WOW to that office space - KILL to have something like that!!! PS - come on by - my first GIVE-AWAY is going on - $45 worth of goodiness!! I love all your choices! I'm a firm believer that if you have someplace nice to work from and someplace nice to come home to, that you are a happier person and therefore, yes, more productive! Free to a Good Home. Or Any Home, Really. Teal Toes- Spread the Word! To Zumba or Not to Zumba?